Privilege. The word alone can make us flinch. The notion that, for no good reason, some might have it better than others offends our sensibilities. Yet until we talk about privilege, we'll never fully understand it or find our way forward. 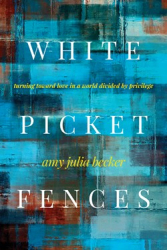 Amy Julia Becker welcomes us into her life, from the charm of her privileged southern childhood to her adult experience in the Northeast and the denials she has faced as the mother of a child with special needs.She shows how a life behind a white picket fence can restrict even as it protects, and how it can prevent us from loving our neighbors well. White Picket Fences invites us to respond to privilege with generosity, humility, and hope. It opens us to questions we are afraid to ask, so that we can walk further from fear and closer to love, in all its fragile and mysterious possibilities. I want to read every word Amy Julia Becker writes. No one else I know captures so completely the ache and the joy of being human. White Picket Fences is her most compelling book yet, tackling one of the thorniest topics of our time and illuminating it with honesty, humility, and hope. Privilege so often involves a conspiracy to forget, and this book gently, unflinchingly insists that we remember. But it also helps us believe that in a world so often torn by violence and indifference, love can still have the last word. - Andy Crouch, author of Strong and Weak: Embracing a Life of Love, Risk. and True Flourishing. As a white mother of black children, I find this topic to be nuanced and highly personal. Amy Julia masterfully created a safe space for my heart to explore what has otherwise felt like a loaded subject. This is a book for every thoughtful soul. - Sara Hagerty, author of Unseen: The Gift of Being Hidden in a World That Loves to Be Noticed.